Set on a hillside in Cape Town’s Bantry Bay, is a landmark Edwardian mansion dating back to 1906. Formerly the private residence of the shipping magnate, Sir John Ellerman, the property has since been transformed into an exclusive boutique hotel by its current owner, businessman Paul Harris, who had a vision to provide a destination with ‘the best South Africa has to offer’. Over the past 25 years, this has meant ongoing updates that today includes an impressive terraced garden, which has been landscaped with indigenous plants from proteas to fynbos; a staggering collection of South African art that has also extended to the opening of an onsite modern art gallery; and a 7,500-strong collection of South African wines. 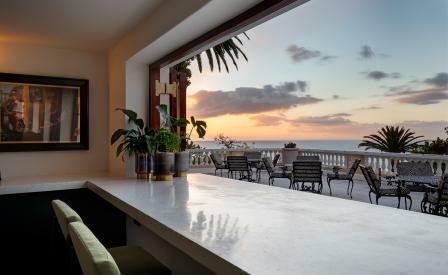 The hotel’s latest addition – and a good spot to sample those bottles – is Bar Roc. Here, Adam Court of local outfit OKHA Interiors, has embellished raw, exposed stone walls with solid brass details, petrol blue and bottle green velvet furnishings, terrazzo flooring (which extends to the sleek bar) and subtle concealed lighting that highlights the carefully curated artwork. Bar Roc is the perfect spot to soak up those spectacular sea views with a sundowner, after a day spent languishing in the spa, or perhaps to enjoy a cosy postprandial tipple after dinner at the restaurant. Here, chef Grant Daniels sends out South African-inspired fare including tasty curries, that nod to his Cape Malay roots. Not open to the public, the 13-room Ellerman House is a quiet bolthole that has retained the intimacy of a private house – not least with thoughtful inclusions such as the guilt-inducing snack pantry that encourages you to literally get your hand caught in the cookie jar.